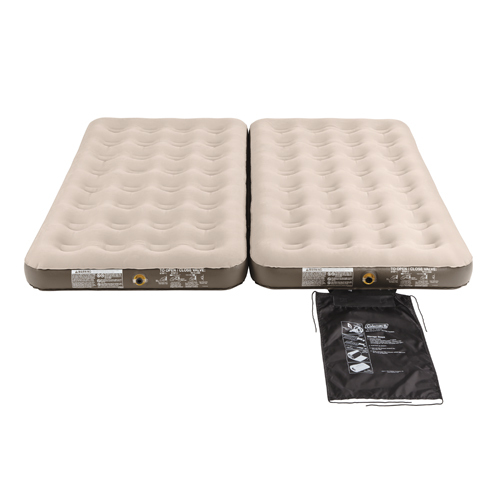 How you sleep is up to you with the Coleman QuickBed 4-N-1 Airbed. The convertible design allows it to be positioned in a variety of ways: as two separate twin beds, one king-size bed, or one double high twin bed for twice the inflated support. Relax on 45 comfort coils that provide superior support while the soft top offers luxurious comfort for sleepers on the go. With durable PVC construction and the Airtight System, your airbed is guaranteed to keep its customized firmness all night long. The integrated Wrap 'N' Roll Storage System allows you to fold, roll and store the airbed quickly-making cleanup easy. It's designed to fit standard king or twin size sheets. - Inflated Dimensions: 73" x 40" x 6.5"